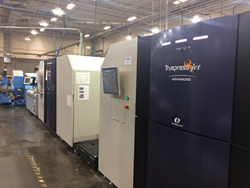 The Truepress Jet520ZZ can produce over a million feet per day, or over 2.2 million double-sided 8 ½ x 11-inch pages within 24 hours. MSP has been a marketing execution powerhouse for over 50 years. Now, the direct mail marketing company has added a Truepress Jet520ZZ to their production floor. The new Inkjet printer will boost production rates and expand capabilities for MSP’s growing list of national clients. The Truepress Jet520ZZ production rates are certainly impressive. The printer produces 722 feet per minute, or approximately 190,000 8 ½ x 11-inch color pages per hour. That’s over a million feet per day, or over 2.2 million double-sided 8 ½ x 11-inch pages within 24 hours. Despite its blistering speeds, the Truepress Jet520ZZ doesn’t compromise on quality. The printer utilizes a single-pass multiple-head array. Distances between printheads for each color are small and distances from the inkjet printheads to the media are short. This ensures a high level of precision. Images are also printed with four tones per dot, which reduces graininess and produces smoother, more professional quality imagery. With these features combined, the Truepress Jet520ZZ is capable of producing vibrant, crystal-clear graphics at lightning speed. MSP looks forward to utilizing the press for upcoming projects. The press can print in full variable color and complete all bindery and perforations in-line. This makes it ideal for high-volume variable data marketing campaigns and a complete array of direct mail features from coupons to inserts. The Truepress Jet520ZZ may be the crown jewel of the printing production floor, but MSP’s most valuable resource will always be its people. In business for over 60 years, the company’s sales, marketing and production staff boast hundreds of years of combined experience in the printing industry. MSP is a full-service direct mail marketing company, offering a broad range of services to its clients. These services include printing, mailing, and web-based marketing portals. MSP opened its doors in 1953, beginning in the home of the founders Richard E. Busheé, Jr. and his father, Richard E. Busheé, Sr. Over the years, MSP transformed from operating in a family basement to a production powerhouse. The company now occupies a 160,000 square foot building outside of Pittsburgh.